BRIAN TRAVOLTA is the country's most entertaining John Travolta Impersonator! Specializing in the films SATURDAY NIGHT FEVER and GREASE, Brian will take you back to the 1970s and recreate your favorite moments from John Travolta's biggest films. Brian is a true triple-threat as a performer. He can Act like Travolta, Dance like Travolta, and Sing like Travolta! Brian is perhaps the only Travolta impersonator in the country who can evoke both films equally well, often in a single performance (if requested). So whether you want to disco dance with "Tony Manero" from Saturday Night Fever, or sing-along with "Danny Zuko" from Grease, BRIAN TRAVOLTA is the only choice! We celebrated my Mom's 86th birthday with a Sinatra singing telegram from Brian in October 2016. I found Brian on the internet while searching for singing telegrams. He was listed for all of his John Travolta events, dancing, singing, etc. After one phone conversation with him, I booked our event. Brian traveled from Brooklyn, NY to Princeton, NJ and was professional in every way. Brian showed up in a tuxedo with a black hat, he sang NY, My Way and Happy Birthday. It was apparent that he was no amateur but rather a seasoned and accomplished artist. He was engaging with my Mom and interactive with our family and friends, his performance made everyone feel they were at a great show. He customized each song to add personal characteristics about my Mother, both sentimental and funny. Brian delivered a wonderful performance and it was the highlight of my Mom's party. I can't stop singing Brian's praises; he is talented, professional, likeable, reliable, fun and organized. Brian was amazing. Maria-- Thank you for your enthusiastic review! Your Mom & guests had great spirit, and I immediately felt welcome. Thanks for the tidbits about your Mom that helped me customize the song lyrics! Brian was fantastic for our Disco Themed Event - he played the role of Tony Manero from Saturday Night Fever and really entertained the crowd, mingled with our guests never leaving character. Renee-- Thanks for the kind words! Everyone at the lodge had great enthusiasm, and I'm glad I could contribute to the celebration! What a Great Addition to our Function! I recently hired Brian to be part of the entertainment at a 70's/Disco party. Not only was he incredibly professional and easy to work with but he wowed my crowd! He was so interactive and immediately got people on the dance floor. Guests are still talking about how fun it was to dance with him and what a great addition he was to the band. He far exceeded my expectations which is not an easy thing to do! Dear Jessica-- Thank you for your kind words! It was a joy to perform at Bill's birthday party. It really was a celebration. Glad I could contribute! sang Sandy substituting the name Annie. The bridesmaids sang along with Annie, they knew all the words to the songs. I would recommend Brian to anyone who is looking for a John Travolta look alike. He is totally believable as John, speaks like him, looks like him and he REALLY CAN SING. Barbara-- Thank you for taking the time to write such nice things! I was so proud that Annie & Sam took me at once. And it was great that the bridesmaids knew my songs so well. Glad I could contribute to the day! 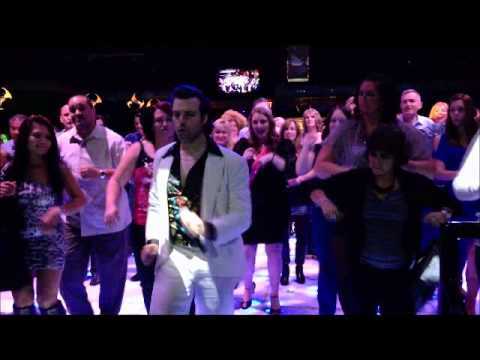 We used Brian "Travolta" for a fundraiser party. He worked well with our band and got our attendees up and dancing. He was very easy to work with (low maintenance) and engaging. Thanks for the kind words, Priscilla! You had a fun group! Great performer and just awesome! We brought Brian in to do a simple singing telegram to our birthday girl in our New York office. He called back immediately upon my request for a quote and was a pleasure to deal with the whole rest of the way. His singing was great and his moves spot on! Let's not mention the oo's and aw's when he took off his jacket!! He not only entertained the NY office but our office as well which joined in via Skype. He put forth a 150% effort in accomodating all our crazy requests and never said "I can't". You were great Brian and we will certainly use your services again. Margie-- Thanks for your praise! It was a great experience performing at LaGuardia Airport! And I think that was the first time I had a live audience on Skype! October 27, 2013 AMAZING! THANKS TO BRIAN TRAVOLTA! When I first called Brian Travolta, I was immediately impressed by his professional and courteous demeanor. I explained the event to him, and over the course of a few days, I updated him on my attempts to do our party either in a restaurant, limo, or other private space. He is a NICE guy in the best sense of the word. He explained to me how he works, the PA system, what type of setting would be optimal for his performance, etc. I finally had the party in my own home, (it was a Birthday Party for my wife,) and on the designated day and time, he was punctual, completely prepared with the outfits we discussed....everything!! 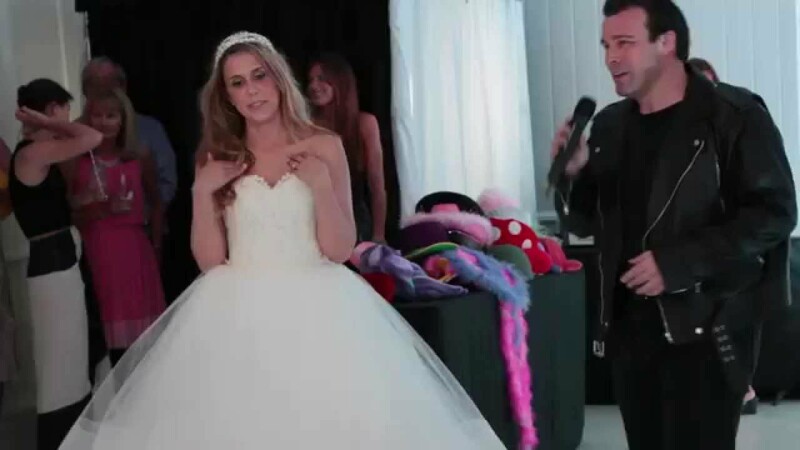 When he surprised my wife and the party-goers everyone was so happy, and into the "Act"!!! His performance was amazing, and everyone shared with me how much they liked him and couldn't get over where I found this guy. Mind you, he's not just an impersonator, he's a great singer, master of ceremonies, and I'm sure he has many other talents. I would hire him again in a second, and I have nothing but praise for Brian Travolta. By the way, the group that I invited to my wife's party was a bit of an eclectic mix, (orthodox Jews, and there were some children as well - from teenage girls to literally toddlers - who came with their parents). Some attendees were very into it, while others were a little more standoffish. Without being prompted, Brian Travolta ever the impresario of the dance floor, also displayed amazing tact and diplomatic skill in navigating his moves thru these religious sensibilities. A veritable challenge for anyone, and he did it with such aplomb and grace. Thank you Brian for an amazing celebratory evening. Adam-- Thank you for your enthusiastic review! I enjoyed performing for your family, and appreciated your warm hospitality. Really gets the crowd involved! I hired Brian to do a set at my sister's wedding as a surprise. He was fabulous! His performance was top notch and he really got the crowd involved. He had to travel quite a distance to get there but he was very professional, on time and looked great! From our first conversation to our last, Brian was very personable and friendly. Highly recommend him for any event! Brian was by far the BEST impersonator I have ever seen! He performed for my moms surprise 40th disco party! He definitely nailed it! He was all natural and perfect for the character of Travolta! He even slicked back his own hair! He had the crowd going and was able to get everyone out of their seat to include them in his performing acts! My mom had a blast and loved dancing with him and so do I! I would love to throw a disco party every weekend just to see Brian perform again!! He did such a great job and made our night especially for my mom! I stumbled across Brian here by accident, or as I like to think, by pure luck. I had been looking for a belly dancer for my friend who is throwing a party. Funny enough, my family and I were planning a 40th surprise Disco party for my sister. Never in a million years did I think of looking for an impersonator for her party. I saw Brian and knew we had to have him! My sister loves John Travolta and Saturday Night Fever. I loved Brian's look and the fact that he does not wear a wig or hair piece. He naturally has a handsome Travolta look to him. He was super easy to work with, professional, and a true gentleman. He did travel a bit of a distance for the party and had no problems doing so. Brian absolutely has Travolta's voice, dance moves and manorisoms down perfect. This guy can dance! He's has non stop energy! He got men and women both up on the dance floor and really pumped up the crowd. His singing is dead on to Danny from Grease. Brian made my sister the center of attention. He danced with her and sang to her. He was funny and entertaining. The guests are still raving about him! Brian makes local appearances and we plan on following him to his next public gig in our area. Wish we had a reason to book him again this weekend! He was just so much fun! He will make any event memorable. Brian was a true gentleman. He did a wonderful job entertaining my guest. We all danced. I felt truly special when we danced to "more than a woman" with him. He danced just like the movie "Saturday Night Fever." If you're looking for something different and entertaining this is the guy! Brian was really sweet with my daughter too...she is only four and she approved! Brian Travolta was at my friend’s party. He was really professional and entertaining. We all have fun dancing with him! Perfect for getting the crowd involved and promoting events throughout the day. Great to work with! Brian Travolta was my children's surprise for me on my 60th birthday. And, oh, boy, I was really suprised. It was really my dream to dance with JT, and on that night, Brian made it happen for me. He sounded and moved like JT. Our very first dance looked like it was choreographed. He was a lot of fun. He made me and all my guests so happy. He entertained and got into the dance floor everybody including my guests who usually do not dance. My friends have not stopped talking about him. I am definitely going to hire him again and recommend to everybody. Hands down best John Travolta impersonator! He was a suprise guest for my mom's 60th birthday party and he really made the night so enjoyable - it was awesome. He danced with my mom and our guests, Brian was engaging everyone to have fun. And you have to hear this guy, sounds just like JT!! We all had a great time. Thank you Brian for making our night special. Brian "John Travolta" was very professional and courteous from the moment we first spoke. He came through on everything he promised - and then some! His performance, which was a complete surprise for a party of 250 people - was incredible! Some party-goers took a minute to figure out if he was the "real" John Travolta - it was great! He had everyone dancing, smiling and having a most wonderful time. I can assure you that Brian doesn't disappoint. His appearance will be remembered for many years to come, indeed! Brian really got our group up on their feet dancing. We are a disabilities workshop and Brian was very sensitive to our clients and got them motivated to really dance. He made the event so much better. Megan-- The Honor was mine! A fantastic performence and very professional ! I wanted to say that I had the very best time at my sister's 50th Birthday party last night. You were amazing!! I loved it, loved it, love it! Your performence was even better than I expected. My sister was relieved to know you weren't a stripper. She also thought your performance was fantastic and made the party! Susan-- Thanks for those kind words! I'm glad I was a good match for your sister's taste! We hired Brian to perform at our camp for people with disabilities and their families. All I can say is this was the best entertainment we have had in 10 years. His performance was more than we expected, he interacted with the audience, adapting easily to the different levels of abilities of the audience members. I haven't seen smiles like that on some of our female campers in a long time. We may just have to build our camp theme for next year around Brian's show. Deb-- I'm thrilled I made a memorable impact! And I'd love to collaborate on next year's theme! We recently hired this entertainer to provide some "Grease" entertainment at our weekend camp. This camp had a wide age range of people, including handicapped and developmentally disabled individuals. All I can say is WOW!!! Everyone was blown away. He was a dead ringer for Danny. He interacted with the campers and got everyone involved. I want this theme every year now so he can come again and again! Denise-- I'm happy that I lived up to expectations! And I would love to perform for the Camp again! Every year we do a theme for our weekend camp for individuals with disabilities and their families. This year's theme was 'Grease' so we wanted to have entertainment related to the movie. After searching online I found Brian "Travolta". WOW. He was absolutely wonderful. He engaged our audience, danced with the campers, taught them dances, and charmed his way to even the youngest member's heart. We thoroughly enjoyed his show, and had EVERYONE tell us what fun it was. As we camp is in a rural area we put him up in the Med Shed at camp. After the show and he relaxed, he joined us for the rest of the evenings festivities, at the dance and pool. We were very thrilled with him. Five stars does not do him justice. Can't we give him an infinite amount? Laura-- I'm glad I could bring your GREASE Weekend to life! It was an honor to perform at the camp, and everyone's hospitality was great! I saw Brian perform for a Food Network event with his Danny Zuko impersonation. Aside from the costume, dancing, and overall character traits, Brian also sounded EXACTLY like Travolta in Grease in several songs he sang at the event. He also got the crowd to sing and dance along too, which was fun. Overall, I thought his performance took the event to another level and since I've always recommended him for someone who's looking to do something a little different for an event or for a special occasion. Cathy-- I'm glad I got to dance with you that night. And thanks for joining me on stage for "Greased Lightning"! I have seen Brian in action and all I can say is he is amazing. He really know his stuff and is a great performer always entertaining and keeps the party going. Lauren-- Thanks for the praise! I love how you and everyone else joined me to dance right away! I hired Brian for my sister's 40th Surprise Party. He did an incredible job, was very professional and received lots and lots of compliments. 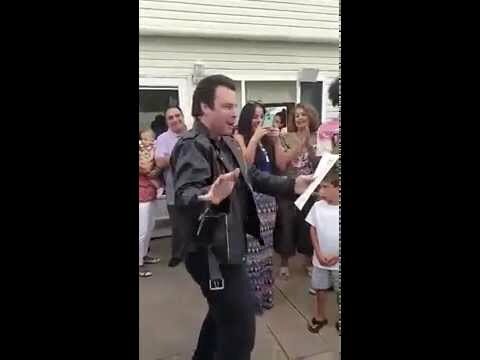 He got both the kids and adults involved with the music - singing and dancing to all the Grease songs we know and love. Awesome party! Mady-- I'm glad I could connect with both the adults and the kids! Brian Travolta- I'd hire him again! After seeing Brian Travolta perform at Ugly Disco in Rochester, NY in 2007, I came up with a brilliant plan. I was going to host a Travolta themed party. Brian Travolta flew into Rochester a few months later, fully ready to entertain my party. He sang and danced for hours, and was nothing but pure entertainment. He spent the first half of the evening as Tony Manero, and ended it with Danny Zuko. One especially memorable moment was when he began serenading people in the backyard. He was so much fun that I hired him again to perform a singing telegram later that summer. He's reasonable with pricing, super friendly, and shows an excellent performance. I fully recommend him! Katie-- You sure know how to throw a party! I'm glad I could contribute. If You Want A Party to be a Party and A Show to be A Show, Then Book Brian!! Tom-- I've always enjoyed your events! Glad I could entertain so many of your friends and colleagues. And I look forward to your next call! Brian Travolta is extremely versatile, charismatic, charming & talented ! He is a top notch performer & consummate entertainer ! Brian totally embodies any character he is impersonating, he has the look, mannerisms, the voice, the dancing and the personality - some performers look similar to the character they are portraying and/or lip synch .. not Brian .. he is the FULL PACKAGE & REAL DEAL ! Shirley-- I'm glad I made such an impression! Thank you for your kind words. I was in the audience for the Brian Travolta experience. He had the audience rocking out , His singing was excellent. It was a pleasant surprise to see a Travolta impersonator who actually sings and doesn't just lip sync. Plus his charisma and stage presence transported us to the "Grease" days. He had the entire audience singing and dancing to the music !! I look forward to seeing him again. I'm glad you could be there to enjoy my GREASE skit. I'll let you know when I'm performing locally again. Brian performed in Times Square's newest venue as Mick Jagger with his band "The Rolling Tones" and John Travolta. He was charismatic, charming, entertaining and energetic. Sings just like Travolta and great as Jagger. I highly recommend him for any event! Sarah-- Thank you for taking the time to write! I had a great time performing that night. I just upgraded my Gig Salad profile, and I'm going over my past reviews. I know it's been 5 months since you saw me, but I want you to know I'd love to do a repeat performance. I hope to be in touch! I have hired Brian Travolta for many events. His Travolta act mesmerizes the crowd and is a fun addition to any event I have that has a dj or band where I want the crowd to dance. He is a true dance motivator- a delight to watch- a delight to dance with. He is the detail that brings my events to extraordinary!! He is an incredibly talented performer! Tiffanie-- It's always a pleasure to see you in Massachusetts! Jean-- Thanks for having me at Brandi's party! She was so much fun, and I'm glad your guests enjoyed the "Travolta" theme-party. I was so SHOCKED when Brian aka John Travolta walked into my Surprise 40th Birthday I thought I was going to die!!! He made my party!! No one was expecting him. He was OUTSTANDING!!! He was the icing on my cake!! He had the crowd up dancing and singing. To this day my family and friends said it was the best party they have been to. I thank you Brian for that!!! If someone is looking for the BEST John Travalta impersonator look know further Brian is the one. Thank you Brian for such a memorable birthday I will never forget. Brandi-- I'm glad you and your family had such a great time! It's an honor to be told our party was the best your guests had ever attended!